After the furore of last weeks success we’re back down to earth with a bit of a bang. We’re now trying to code the Raspberry Pi so it will read, and more importantly broadcast the readings from the 1Wire sensors to Plot.ly, the MET office or an alternative means of hosting the data online. The 1Wire sensor is already waterproof and designed to run in series with other 1Wire sensors which would greatly help with the expansion plans for the project. Although the Bosch BMP180 and the associated code worked, the sensor isn’t designed to be outdoors and nor does it measure water temperature. So I’ve turned to the 1Wire system. We’re introducing the 1Wire to i2c board into the mix. Hopefully allowing us to connect multiple 1Wire sensors using the RJ12 socket. Previous coding was fairly rudimentary as a lot of the compiling had been done for us. This new endeavour requires our own interpretation of the code and its application. So I’ve tidied the desk – when ever I really need to concentrate I always start by cleaning the studio. 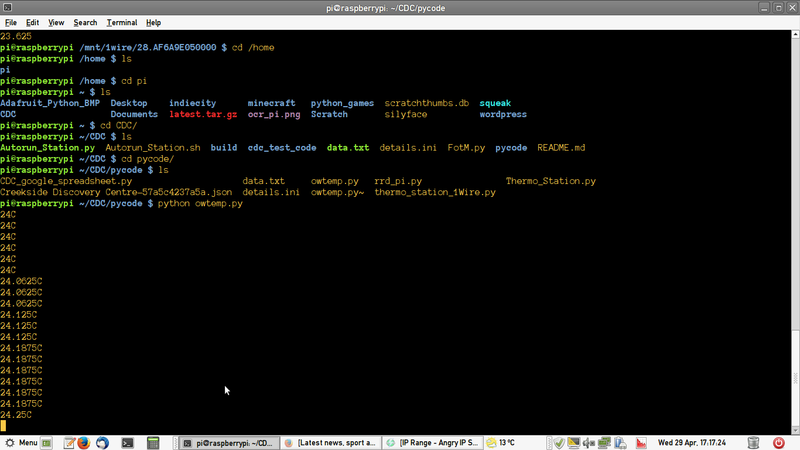 This is a screen grab of the code compiling the 1Wire File System. We actually managed to get this running by connecting to the Pi remotely using SSH. Something we’ll need to do once the Pi is installed at the Creekside Discovery Centre. Apart from the fact that visiting the site to check or make changes to the code will be inconvenient, there isn’t going to be a monitor attached to the Pi so remoter access is the only sensible way to control the device. A simple bit of Python code meant we could read the sensor data. This code was reading from the Pi’s ROM so although we’re getting real time readings, the data isn’t being stored yet, let alone uploaded. Still, seeing the new sensors working was a huge relief. # owtemp.py. This script displays the measured temperature in C in the terminal window. # The file name and path uses the unique id generated by the onboard ROM on the sensor. pwd – Present Working Directory – really important to know where you are when executing code. ls – Checking that the files you need are actually present in the directory you’re in. The slight increase in the temperature is simply a result of me holding the sensor in the palm of my hand for a moment.